Today’s Bible readings are Isaiah 52.7–10; Psalm 19.1-6; Romans 10.12-18; Matthew 4.18-22. I thank you today for the followers of Jesus by whose words and deeds I have learned about you. Help me, in my turn, so to live and speak that others might be drawn to you. and restless souls might find their rest in you. The season of Advent begins tomorrow (Sunday 28 November). For the churches that observe it, the season is one of hope, expectancy and waiting as Christians prepare to celebrate the birth of Jesus at Christmas. At Didsbury Baptist Church we will concentrate on Advent themes and light candles on the Advent Wreath Sunday by Sunday. Many of us will also participate in a daily Bible-reading scheme. As we read, we will pray, listen and open our hearts to what the Spirit may be saying to us. On Wednesday evenings we will meet together to discuss what we are learning, hear Advent music and sing some Advent songs, and pray for each other and for the world. The season offers an opportunity to stop and be quiet, to resist some of the frenzied activity associated with the run up to Christmas and listen for the voice of God. 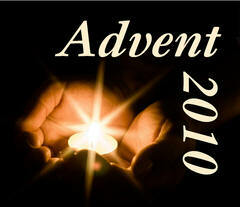 You can join us in our Advent journey here. Each day of Advent, I will upload the Bible readings for the day with a short reflection. (If you would like to see the readings in advance, download them here.) I invite comments and responses of your own. You can leave these in the comments area below each post. I hope other members of the Church might provide some of the articles and perhaps some artistic responses to the daily readings along the way. Daily Advent reflections can be found on other Internet sites too; see, for example, hopefulimagination.